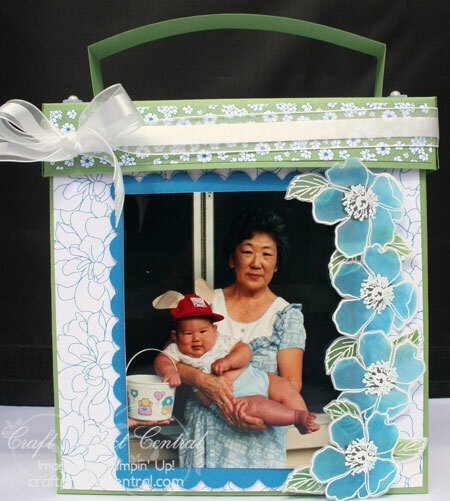 In honor of National Scrapbooking Month, the bonus project this month at CPC is a really neat Scrapbook in a Box! Lift the handle on the box and you have a 6" x 6" album tucked away inside! This is a perfect Mother’s Day gift, or you could even make it up as a special teacher appreciation gift for the end of the school year (which I think for a lot of kids is coming up soon!). Makes for a fun class project as well! This great project comes to you from Sharon. Please stop by Sharon's blog and leave her a comment on this beautiful project! To get the instructions for Sharon’s project, just subscribe to May, and meet one of the other bonus project requirements of, subscribing to two or more months in a row, putting the Craft Project Central badge/blinkie on your blog, or referring a friend and letting us know when they subscribe! Gorgeous project Anne Marie! I love all those pretty blossoms. Have a great day!